NCS Doncaster have raised an incredible £4,426.11 for Doncaster Cancer Detection Trust (DCDT) over the summer through carnival style games, face painting and a tombola based at the Frenchgate centre. Three different groups from different waves set up in Frenchgate and dedicated 30 hours each of voluntary community work to raise as much as they could for the close to home charity. The money will be put towards a new CT scanner, which will prove to be vital in the journey to beating cancer. Yvonne Woodcock, former Civic Mayor and current DCDT trustee commented: “I can not believe how fantastic these young people have been, and how utterly devoted they have been this week to making a difference. “There is often a misconception about young people of today and this group have made such a fantastic reputation for themselves in the community, for their passion and how willing they were to help. They are a credit to Club Doncaster, NCS and their families. Prizes in the tombola won by the public included a signed Doncaster Rovers football, donated kindly by Club Doncaster Foundation, food vouchers and lots of designer goodies, all up for grabs for just £1. 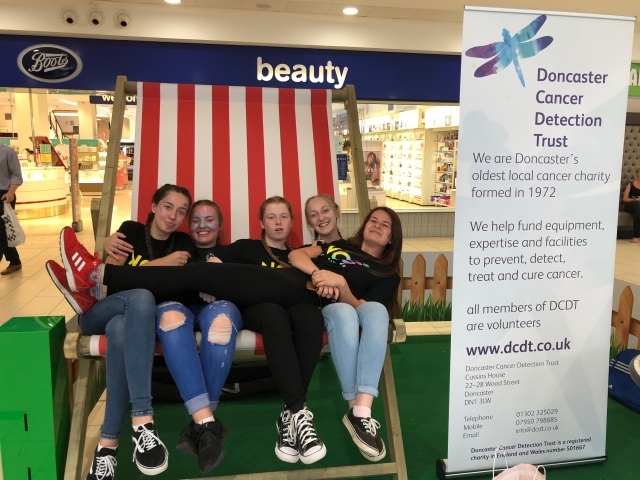 For more information about NCS, contact the team on 01302 764663, or via the website on https://clubdoncasterfoundation.co.uk/ncs.